A close-range strike by Andy Dorman in the last minute gave St Mirren a hard-fought victory over Kilmarnock in the Co-operative Insurance Cup third round. St Mirren had the upper hand in the first half, but the home side had the better chances, notably through Conor Sammon and striker Kevin Kyle. Stephen McGinn drove the opener in 63 minutes for the Buddies before Kyle headed a late equaliser for Killie. But with the match heading for extra-time, Dorman's shot won the tie. The Buddies' midfield dominated the early exchanges, but St Mirren number one Paul Gallacher was the busier goalkeeper. First he saved a Conor Sammon overhead kick, then moments later a Kevin Kyle header from a left-foot cross by Garry Hay hit the Buddies' post. In the second period the visitors continued to pester the Killie defence, which was minus injured Tim Clancy and Simon Ford, and Dorman, a 60th-minute sub for Garry Brady, brought the best out of Mark Brown moments before the Saints took the lead. The St Mirren goal came when McGinn drove the ball from the edge of the box beyond Brown for his fourth of the season, and his third against Kilmarnock. David Fernandez squandered the chance to equalise for Kilmarnock, hesitating when he ought to have done better against Gallacher. And with Kilmarnock pressing, Gus MacPherson's side were ready to pounce on the counter-attack and did so with eight minutes remaining when Dorman raced in on goal but found Brown equal to his shot. Kyle came to the Ayrshiremen's rescue late in the game, powering a header beyond Gallacher and it looked like the game would go into 30 minutes of extra-time. Then, incredibly, Dorman snatched a last-gasp winner to put Saint Mirren into the last eight of the tournament. 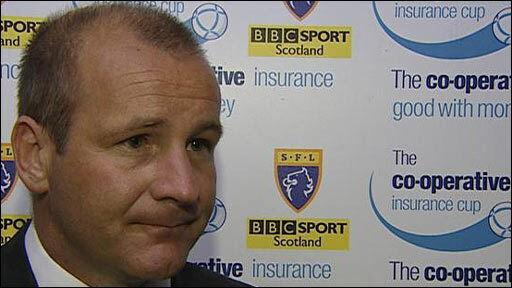 St Mirren manager Gus MacPherson: "It was a game that could have gone either way. Kilmarnock have that aerial threat. At every opportunity they try to get the big men forward. "Andy Dorman was similar last season: he was slow to start. He had a very good chance at 1-0 when he tried to be too cute, but he learned from it and the next chance he buried. "Stephen (McGinn) is maturing, taking the responsibility. He has got the number four jersey and we have wanted him to take confidence from that and he is learning all the time." 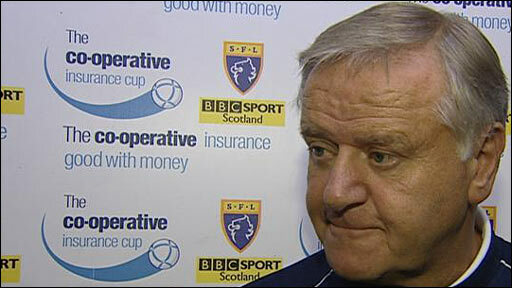 Kilmarnock manager Jim Jefferies: "They were stunned by the late equaliser and I thought we would go on (to win). "We had a couple of great opportunities in behind them to get decent balls in but we didn't put in the final ball that Kevin (Kyle) was looking for. "I thought St Mirren were the better side in the first half. We've not played as well as we have been playing. The second half was a bit better and we pushed to get a goal. "I would have fancied us if it had gone to extra-time because I think St Mirren were rattled. "There is very little between the teams. It's been a struggle the last few years here but we'll do the best we can and we'll bounce back on Saturday." 90:00+3:12 The match has reached full-time. 90:00+2:06 Assist on the goal came from Steven Thomson. 90:00+2:06 GOAL - Andy Dorman:Kilmarnock 1 - 2 St Mirren A goal is scored by Andy Dorman from close range low into the middle of the goal. Kilmarnock 1-2 St Mirren. 89:22 Ryan O'Leary fouled by Billy Mehmet, the ref awards a free kick. Free kick taken by Jamie Hamill. 88:16 Kevin Kyle is flagged offside by the assistant referee. Paul Gallacher takes the free kick. 86:28 Assist on the goal came from Jamie Hamill. 86:28 GOAL - Kevin Kyle:Kilmarnock 1 - 1 St Mirren Kevin Kyle grabs a headed goal from close range. Kilmarnock 1-1 St Mirren. 84:59 Kevin Kyle gives away a free kick for an unfair challenge on Jack Ross. Direct free kick taken by Paul Gallacher. 84:29 Free kick awarded for an unfair challenge on Mehdi Taouil by Hugh Murray. Mark Brown takes the direct free kick. 83:40 Substitution Michael Higdon joins the action as a substitute, replacing Craig Dargo. 83:08 Substitution Daniele Invincibile joins the action as a substitute, replacing Steven Old. 82:44 Andy Dorman takes a shot. Save made by Mark Brown. 81:58 Free kick awarded for a foul by Jack Ross on David Fernandez. Free kick crossed left-footed by Garry Hay, Stephen McGinn manages to make a clearance. 80:41 David Fernandez is caught offside. Free kick taken by Paul Gallacher. 79:11 Outswinging corner taken right-footed by Andy Dorman, clearance made by Kevin Kyle. 78:39 Inswinging corner taken by Andy Dorman. 76:51 The assistant referee signals for offside against Craig Dargo. Mark Brown restarts play with the free kick. 73:36 Outswinging corner taken from the right by-line by Andy Dorman. 73:15 Free kick awarded for a foul by Conor Sammon on Jack Ross. John Potter takes the direct free kick. 72:34 Free kick crossed right-footed by Jamie Hamill from right channel, save by Paul Gallacher. 72:34 Booking David Barron is shown a yellow card for unsporting behaviour. 72:19 David Barron concedes a free kick for a foul on Mehdi Taouil. 71:33 David Fernandez produces a left-footed shot from just outside the box that goes wide right of the target. 70:35 Ryan O'Leary concedes a free kick for a foul on Billy Mehmet. Hugh Murray takes the direct free kick. 69:50 David Fernandez crosses the ball, John Potter makes a clearance. 69:37 Hugh Murray challenges Kevin Kyle unfairly and gives away a free kick. Free kick taken by David Fernandez. 69:00 Garry Hay crosses the ball, save by Paul Gallacher. 67:51 Steven Thomson challenges Kevin Kyle unfairly and gives away a free kick. Direct free kick taken by Garry Hay. 63:09 GOAL - Stephen McGinn:Kilmarnock 0 - 1 St Mirren Goal scored by Stephen McGinn from the edge of the penalty area high into the middle of the goal. Kilmarnock 0-1 St Mirren. 62:06 Corner taken by Gavin Skelton from the left by-line, Billy Mehmet makes a clearance. 61:01 The ball is sent over by Jack Ross, save by Mark Brown. 60:39 Steven Thomson takes a shot. Mark Brown makes a save. 59:16 Substitution (St Mirren) makes a substitution, with Andy Dorman coming on for Garry Brady. 58:22 Unfair challenge on Conor Sammon by Hugh Murray results in a free kick. Direct free kick taken by Garry Hay. 56:29 Free kick awarded for a foul by Frazer Wright on Billy Mehmet. Garry Brady delivers the ball from the free kick right-footed from right channel. 55:50 Free kick awarded for a foul by David Fernandez on John Potter. Free kick taken by Paul Gallacher. 53:10 Substitution David Fernandez joins the action as a substitute, replacing Manuel Pascali. 51:17 The ball is swung over by Garry Hay, Paul Gallacher makes a save. 48:45 Foul by Steven Old on Stephen McGinn, free kick awarded. The free kick is delivered right-footed by Stephen McGinn from left wing. 47:54 Booking Manuel Pascali receives a caution. 47:46 Stephen McGinn fouled by Manuel Pascali, the ref awards a free kick. Lee Mair takes the free kick. 47:30 Steven Old delivers the ball, Paul Gallacher makes a save. 45:15 Unfair challenge on Ryan O'Leary by Billy Mehmet results in a free kick. Jamie Hamill delivers the ball from the free kick right-footed from right channel, clearance made by Lee Mair. 45:00+1:25 The match has reached half-time. 45:00+0:43 Kevin Kyle challenges John Potter unfairly and gives away a free kick. Direct free kick taken by Paul Gallacher. 45:00+0:16 The assistant referee flags for offside against Billy Mehmet. Free kick taken by Mark Brown. 45:00+0:08 Free kick awarded for a foul by Garry Hay on Garry Brady. Jack Ross takes the free kick. 45:00 Substitution Gavin Skelton replaces Craig Bryson. 44:44 Centre by Jack Ross, Ryan O'Leary manages to make a clearance. 43:49 Craig Dargo gives away a free kick for an unfair challenge on Manuel Pascali. Free kick crossed left-footed by Garry Hay. 43:00 Foul by Garry Brady on Conor Sammon, free kick awarded. Garry Hay takes the free kick. 42:21 Conor Sammon challenges Lee Mair unfairly and gives away a free kick. Free kick taken by David Barron. 41:56 Garry Brady crosses the ball. 40:41 The referee blows for offside against Jamie Hamill. Paul Gallacher restarts play with the free kick. 39:35 Garry Brady takes a outswinging corner from the right by-line played to the near post, clearance by Manuel Pascali. 39:07 Inswinging corner taken right-footed by Garry Brady, Manuel Pascali makes a clearance. 38:02 Unfair challenge on Jack Ross by Mehdi Taouil results in a free kick. Direct free kick taken by Paul Gallacher. 37:48 Effort from 25 yards by Craig Dargo. Save made by Mark Brown. 36:39 Effort on goal by Steven Old from long distance goes over the crossbar. 35:48 Conor Sammon takes a shot. Blocked by John Potter. 34:51 Free kick awarded for an unfair challenge on Conor Sammon by John Potter. The free kick is swung in left-footed by Garry Hay. 33:39 Corner taken right-footed by Craig Bryson, Close range header by Frazer Wright misses to the right of the target. 32:52 Jamie Hamill decides to take the corner short, Craig Bryson produces a cross. 31:44 Effort on goal by Jack Ross from long distance goes over the crossbar. 27:40 Corner taken right-footed by Garry Brady, clearance made by Kevin Kyle. 24:19 The assistant referee flags for offside against Craig Dargo. Mark Brown takes the indirect free kick. 19:05 Hugh Murray produces a curled right-footed shot from 25 yards. Save by Mark Brown. 18:08 Free kick awarded for a foul by Jamie Hamill on Craig Dargo. Direct free kick taken by Paul Gallacher. 17:19 Foul by Craig Dargo on Manuel Pascali, free kick awarded. Jamie Hamill sends in a cross, Kevin Kyle takes a shot. Save by Paul Gallacher. 16:10 Manuel Pascali fouled by Craig Dargo, the ref awards a free kick. The ball is sent over by Garry Hay, Header by Kevin Kyle from inside the area hits the post. 14:44 Inswinging corner taken by Garry Brady. 13:59 Shot by Conor Sammon. Save by Paul Gallacher. 12:12 The referee gives a free kick against Garry Hay for handball. Indirect free kick taken by Paul Gallacher. 10:22 Paul Gallacher fouled by Jamie Hamill, the ref awards a free kick. Paul Gallacher takes the free kick. 9:32 Kevin Kyle fouled by Hugh Murray, the ref awards a free kick. Free kick taken by Mark Brown. 7:33 Free kick awarded for a foul by John Potter on Kevin Kyle. Garry Hay takes the direct free kick. 6:42 Manuel Pascali concedes a free kick for a foul on Craig Dargo. Free kick crossed by Stephen McGinn, Kevin Kyle makes a clearance. 4:49 The referee blows for offside against Jamie Hamill. Free kick taken by Paul Gallacher. 3:56 Frazer Wright challenges Billy Mehmet unfairly and gives away a free kick. Jack Ross takes the free kick. 1:29 Lee Mair fouled by Conor Sammon, the ref awards a free kick. Free kick taken by Paul Gallacher.